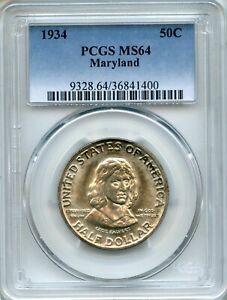 After the dry spell of 1929-33, in which no new commemorative coin types were issued by the United States Mint, the Maryland half dollar was at the vanguard in 1934. Though it wasn't the first new issue authorized (that honor going to the Texas half dollar), it was the first one coined and distributed. As such, it ushered in a golden age of commemorative coinage that ultimately collapsed five years later amid speculation and scandal. 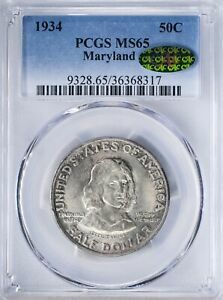 Numismatists are familiar with the undated silver coinage issued for the colony of Maryland around 1659 by Cecil Calvert, the second Lord Baltimore. 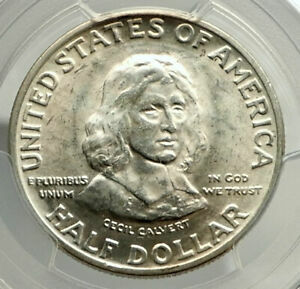 It is this same individual who is depicted on the commemorative half dollar. Some 25 years earlier, Calvert had sponsored the travel of about 200 colonists from England aboard the ships Ark and Dove. They settled in Maryland, a place named for Henrietta Maria, the wife of King Charles I and sister to King Louis XIII of France. This name had been selected by Calvert's father, the first Lord Baltimore. Sadly, George Calvert never lived to see the land granted him by the King, nor did Cecil Calvert himself elect to travel to this new land along the Chesapeake Bay. It was in fact George's other son Leonard, Cecil's brother, who actually governed Maryland. The mostly Catholic colonists set sail from England in the summer of 1633 and established the community of St. Mary's the following year. The impending 300th anniversary of this event prompted the founding of the Maryland Tercentenary Commission in Baltimore. To assist in funding the celebrations planned for the summer and fall of 1934, a bill was sponsored by Senators Phillips Lee Goldsborough and Millard Tydings that would provide for commemorative coins. 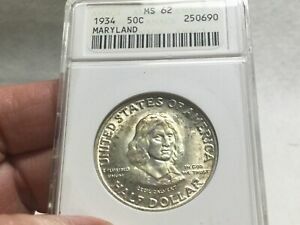 This became the Act of May 9, 1934, and it authorized the striking of 25,000 Maryland Tercentenary half dollars. Commissioned to prepare the models was sculptor Hans Schuler. 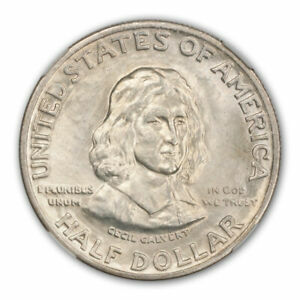 The coin was to display a portrait of Cecil Calvert on its obverse and the arms of Maryland on its reverse. For the likeness of Lord Baltimore, Schuler borrowed from a painting by Gerard Soes. This depiction is considered historically inaccurate, especially in that it shows the Catholic Calvert wearing a Puritan collar! 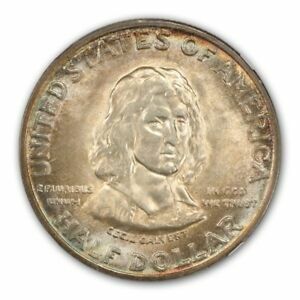 Because Schuler had been hired in advance of the bill's passage, his models were already available for review by the Commission of Fine Arts by the time the coins were authorized. Amid an atmosphere of great urgency, the Commission's sculptor member, Lee Lawrie, tentatively approved the models subject to his minor revisions. These related to both the accuracy of the arms and the balanced arrangement of detail elements. His remarks were transmitted to Schuler, who quickly reworked his models. Lawrie found fault with the continued inclusion of 13 stars, as it crowded the legends and bore no relation to colonial Maryland. He also made reference to the inaccurate style of collar. Schuler complied with respect to the stars, but he defended his modeling of Calvert's collar on the basis of the Soes painting. With some misgivings, the Commission of Fine Arts bowed to the pressure of time and granted final approval to Schuler's latest models, which had been submitted May 24. The transfer of these models to hub reductions was performed by Medallic Art Company of New York City. 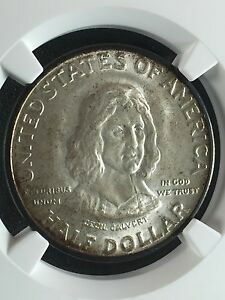 The Philadelphia Mint coined 25,015 pieces in July of 1934, the odd 15 being reserved for assay and later destroyed. 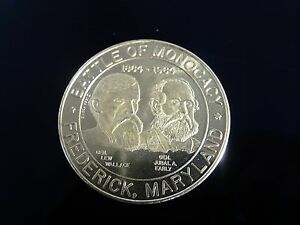 The coins were then delivered on July 10th to the Maryland Tercentenary Commission, which marketed them at $1 apiece both directly and through banks statewide. 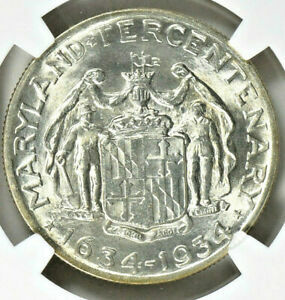 A number were sold to Maryland residents, but most were acquired by coin collectors around the nation. By the time that all the celebrations wrapped up in November, some 10,000 coins remained unsold. 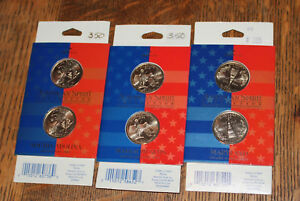 As the coin program dragged on into the new year, another 5,000 pieces were sold at the original price of one dollar. An additional number were moved at the discounted price of 85 cents apiece. The Commission then cut its price per coin to 75 cents for those willing to order in quantity. 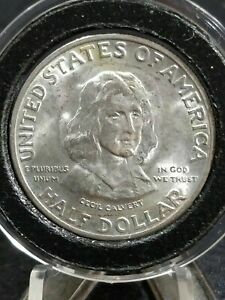 When this failed to sell the remaining coins, the price was slashed still further to only 65 cents per coin in roll quantities. In this manner, several dealers and boosters of the program squirreled away large numbers of this issue which may yet turn up in the marketplace. 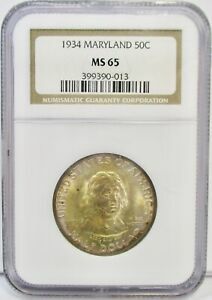 Contemporary correspondence from the Commission to coin dealer L. W. Hoffecker reveals that the last of the Maryland halves were sold around the latter part of April, 1935: "Probably 15,000 of the issue were sold in small quantities - one to say 100, and they were scattered all over the United States. 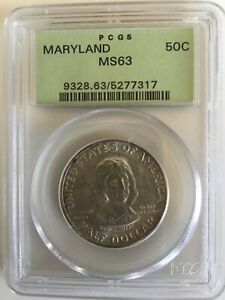 In the beginning 5,000 were purchased for Maryland banks, and just how the banks disposed of them we cannot say, but the 20,000 sold through the office went mostly to individual collectors, except the probable 8,000 sold at a discount to dealers." 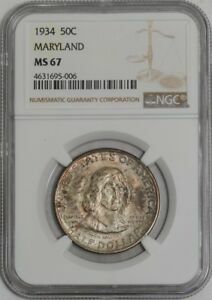 Maryland half dollars are rarely encountered in circulated grades, though quite a number have suffered other forms of abuse over the years. 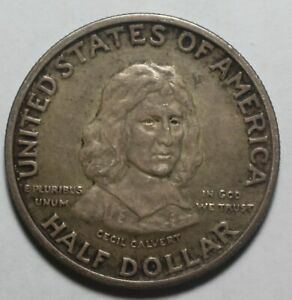 Those acquired by non-numismatists, and there are many such coins, will exhibit abrasions on their highest points, particularly on the face of Cecil Calvert. Some have been polished or cleaned in one fashion or another. Those not mistreated by their owners may still exhibit abrasions and contact marks as the result of rough handling at the mint. 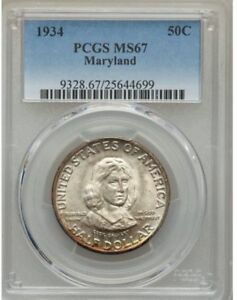 Most of the coins seen today grade from MS-60 through MS-64, and those in higher grades are more elusive. This issue shows obvious signs of hurried manufacture, which is quite in keeping with its abrupt authorization and design. 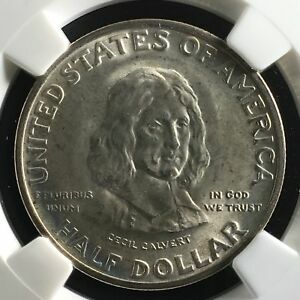 Many coins are not fully struck, and this is most apparent in the features of Lord Baltimore. 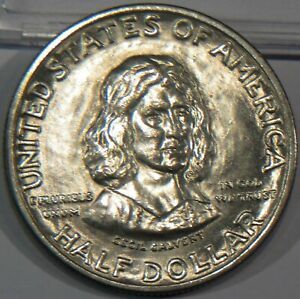 Where the coin's metal has not completely filled the dies, roughness from the unstruck planchet may remain visible as nicks amid lusterless surface. 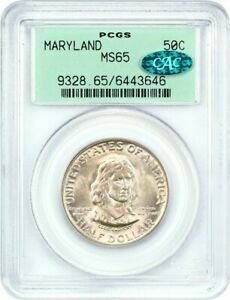 When properly coined the Maryland half dollar can be quite attractive. Its luster is typically of a satiny character, and it ranges from dull to blazing. The textured or modeled surfaces of this coin type help to obscure some of the marks that might otherwise be more obvious to the viewer. Look for signs of wear on Calvert's nose, as well as on the top coronet (with flags) and the adjacent mantling. Unlike many commemorative coin issues, the packaging for the Maryland half was fairly simple. Generic, single-piece cardboard holders, manufactured by Dennison and used for other programs too, were the principal conveyance employed in delivering mail orders. Other coins were shipped within tissue paper. Of more value to collectors is the outside mailing envelope. This is imprinted in four lines: 1634-1934, MARYLAND TERCENTENARY COMMISSION, 902 UNION TRUST BUILDING, BALTIMORE MARYLAND.